Museum Boijmans Van Beuningen brings together works from all over the world by three artists who were decisive for the development of modern art: Constantin Brancusi, Medardo Rosso and Man Ray. This is the first exhibition to combine works by these famous sculptors together with their photographs, affording a unique insight into the artists’ working methods. Masterpieces that have rarely or never been seen in the Netherlands will be lent by important museums such as the Centre Pompidou, MoMA and Tate Modern. Museum Boijmans Van Beuningen will show 40 sculptures and more than 60 photographs by Constantin Brancusi (Hobiţa 1876 - Paris 1957), Medardo Rosso (Turin 1858 - Milan 1928) and Man Ray (Philadelphia 1890 - Paris 1976). The exhibition features sculptures such as Brancusi’s ‘Bird in Space’ (1941) and Rosso’s ‘Ecce Puer’ (1906) alongside works by Man Ray from the museum’s collection, including the sculpture ‘The Enigma of Isidore Ducasse’ (1920/1971). Presenting the sculptures together with the artists’ photographs reveals their often-surprising perspectives on their own works. All three artists lived in Paris at the beginning of the 20t th century and all three documented their own sculptures extensively through photography. The photographs show how they interpreted their sculptures and how they wanted them to be seen by others. Constantin Brancusi is considered the father of modern sculpture with his highly simplified sculptures of people and animals. In his photographs he experimented with light and reflection so that his sculptures absorb their environment and appear to come to life. Medardo Rosso is the artist who introduced impressionism in sculpture. The indistinct contours of his apparently quickly modelled figures in plaster and wax make them appear to fuse with their surroundings. Rosso cut up the soft-focus photographs of his work, made them into collages and reworked them with ink so that the sculptures appear even flatter and more contourless. 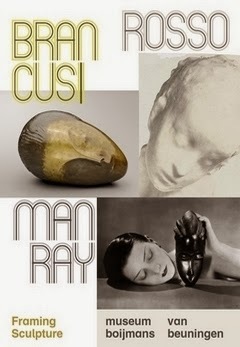 Man Ray is best known as a photographer but was also a painter and sculptor. His choice of materials was unconventional: he combined existing objects to create new works, comparable to the ‘readymades’ of his friend Marcel Duchamp. Man Ray’s experimental use of photography led him to make photographs without the use of a camera. He made these so-called ‘rayographs’ by placing objects directly on photographic paper and exposing them briefly to light, leaving behind a ghostly impression. The photographs of Brancusi, Rosso and Man Ray give the public the opportunity to see the sculptures through the artists’ own eyes. Three multimedia presentations, including projections and animations, will use modern digital techniques to replicate the artists’ explorations of form.